For a review of relevant topics click here. Click the little computer above for a detailed description. In the exercise, the students can add the library, which has been created in this lab, to existing code to test the runtime of three different search algorithms and three different sorting algorithms. A routine's performance can be judged in many ways. In CS210, you have been/will be learning Big O. The idea is that you can estimate the routine's projected execution times as a function of the number of data items (N) that it manipulates as it performs its task. The results are estimates of the form O(N), O(LogN) and so on. Big O allows us to group routines based on their projected performance under different conditions (best case, worst case, etc). Remember that Big O is only an estimate. It does not take into account factors specific to a particular environment, such the specific implementation, the type of computer system we are using, and the data that we are processing. To determine how well or poorly a routine will perform in a particular environment, we need to evaluate the routine in that environment. In summary, for the binary search, you are given a sorted array. The idea is to divide the array into two equal parts and narrow down the range of the array to be searched either to the low part of the array or high part of the array. We will continue narrowing down the range until the value is located, or until we realize that the value searched for is not in the array. The linear search is also known as the sequential search. The idea is start with the first element, and sequentially search through the array until we find a match. Before we can measure the performance of these routines, we must first develop a set of tools that allow us to measure the execution time. To add some complexity to this lab, we will turn this Timer class into a library and use this library for the lab exercise at the end. complexity.cpp: This is the main program. timer.cpp: This is the implementation of the Timer module. It can be compiled into a library once it is bug-free. Store the three files where you can easily find them. timer.h and timer.cpp are useful for calculating running time measurements. Because we may want to use the class Timer over and over again, we may want to put it in a library. 2.3 What is a library? A library is a collection of object files - .obj files similar to the .o files you saw in Unix. Object files can contain individual functions, collections of functions or an entire class implementation. Each object file is stored individually. When your program references a function or class contained in a library, it links the object it belongs to and adds its code to your program. This way you can have one big file to store related things but only the pieces that you actually use in your program are added to the executable file. 2.4 What are header files? Each function or class defined in the C or C++ standard library has a header file associated with it. The header files that relate to the functions that you use in your programs should be included (using #include) in your program. Interestingly one library may have more than one header file. Libraries can be regarded as pre-compiled functions or classes that do not need to be re-compiled if other parts of your project change. If you have a "bug-free" module (a piece of self-contained code) that could be reused with other projects, you can compile this module to a library. After you link this library to your new project, you will then be able to use any of the functions or classes in this library as if they are defined locally in your project. One major advantage is that the functions or classes in the library will not be recompiled, which saves time compiling your entire project. In our example, "timer" is a perfect candidate: it does not contain any bugs and we can use it again in other projects. To use "timer" in a new project, we will have to first compile the C++ programs into a library, and then link this library to the new project. 2.6 Compile the C++ programs using a library. In this program, timer.h and timer.cpp define and implement a time measuring class Timer. This class is independent of the kind of program it is measuring. In other words, we can reuse this Timer class to measure the running time of other programs. It naturally follows that once we make this class bug-free, we can compile it into a library. To use this time-measuring class, we simply include the header file (i.e.timer.h) in the program and link the library to this program. From the "Templates" pane, select "Win32 Console Application"
Take note of the location. You will need it later. The library will be called mylibrary.lib and should be stored in the solution's Debug folder. You can see the path to it in the compiler's output. Go to the folder and look for it. From the "Templates" pane select "Win32 Console Project"
You now have to do three things to add the library that you created to the "link line". Add mylibrary.lib to the list of libraries. Add the corresponding path (or location of this library) to the project. The path is used to locate the library files when the VC++ project is being built. In the "complexity Property Pages", under the expanded Linker folder select the General subcategory. 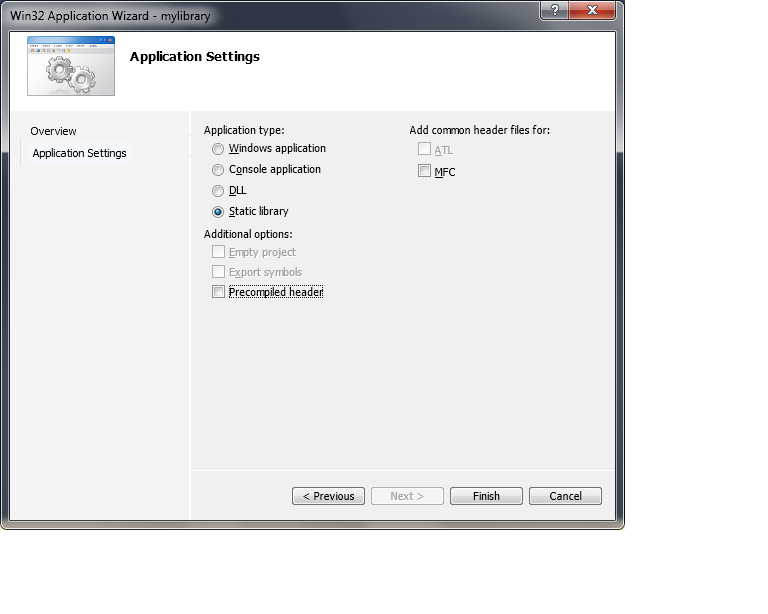 Add the path to the folder where mylibrary.lib is found. Add the path where the timer.h file is to be found. Again, in the "complexity Property Pages" dialog, expand the C/C++ folder. Select the subcategory General and click on "Additional Include Directories". Add the path to the folder where timer.h is found. Your project should build and run like this if you have followed the above steps correctly. You will plot and analyse the execution times of three searching routines. search.h contains the implementation of a set of searching routines. sort.h contains the implementation of a set of sorting routines (used to sort the array so that binary search will work). timesrch.cpp — the main program. Outputs the runtime of the three searching routines. Include the timer library into this program. Compare the execution times of the three searching routines. Adjust the project properties to link to "mylibrary". Add mylibrary.lib to the "Additional Dependencies"
The 2.087e-004 is equivalent to 2.087*10-4 or 0.0002087. Fill in the handout provided by your instructor (Step 2 - Step 5). This involves plotting the time that it takes to run the three algorithms with different numbers of keys. In the end, you will have three lines for the three searches: linear, binary, and unknown. Suggestion: The increments for the "Search time" axis have been left up to you. First, write everthing as 10-6 seconds. Then, create six tick marks along the y-axis: 3, 6, 9, 12, 15, and 18. You will plot and analyse the execution times of three sorting routines. timesort.cpp — the main program. Outputs the runtime of the three sorting routines. Create a normal C++ Win32 Console Application using the two files. Compare the execution times of the three sorting routines. Follow the steps outlined in Part 1 and complete the handout provided by your instructor. Suggestion: The increments for the "Search time" axis have been left up to you. First, write everthing as 10-3 seconds. Then, create ten tick marks along the y-axis: 10, 20, 30, 40, 50, 60, 70, 80, 90, 100. For postlab exercises, click here.